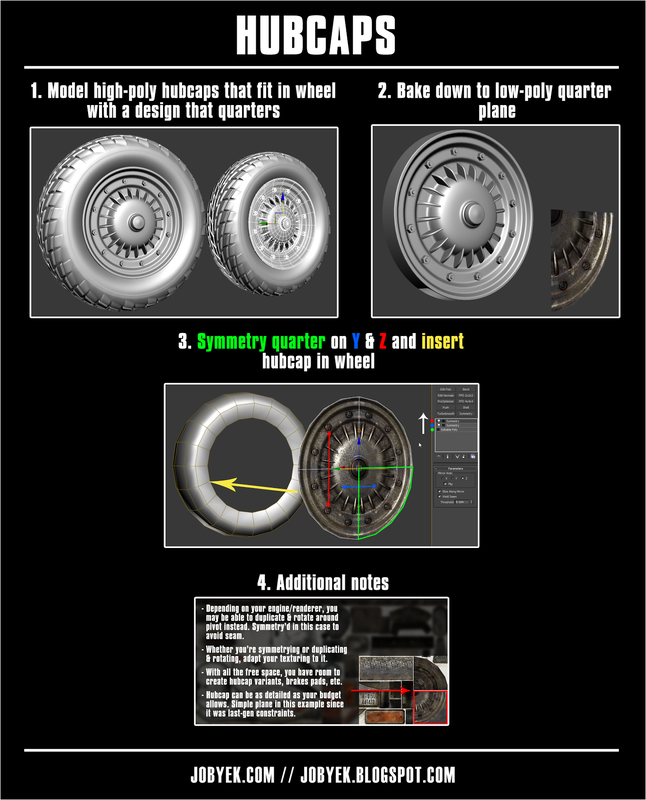 All that to say, this little micro-tutorial will focus solely on creating high-quality & efficient wheels. There are tons of tutorials that focus on full vehicles, so I figured I'll focus one this one part which can ultimately help elevate an already great vehicle. Surprisingly, after having looked around online, I haven't seen the technique I'll be outlining below mentioned at all. 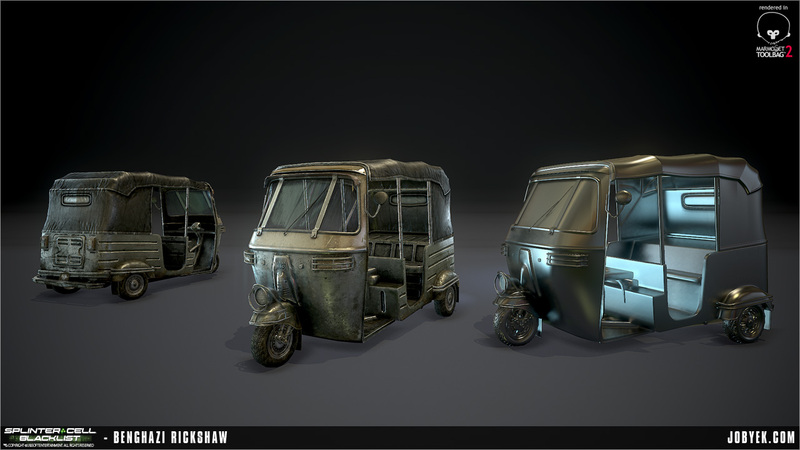 It's definitely a technique that's used more for modular structural environment art to get the best resolution and quality (see how Simon Fuchs uses this with his small environment), but not one I've seen applied too much to something as small as wheels. It's a nice technique that I learned from my good friend and super talented colleague Tim Bergholz (Check out his upcoming gumroad tutorial!) 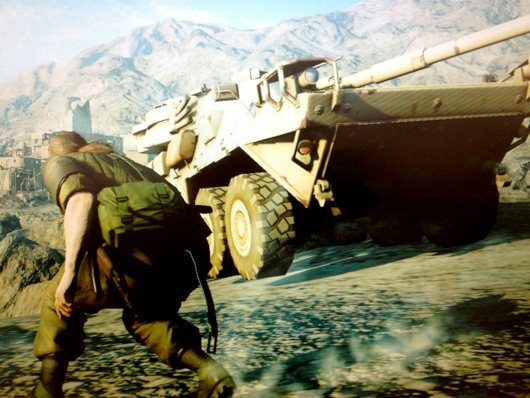 during our time working together on the Benghazi map in Splinter Cell: Blacklist. The over-arching technique that guides this whole tutorial to achieve the best resolution and quality out of your wheel is that of symmetry and quartering. 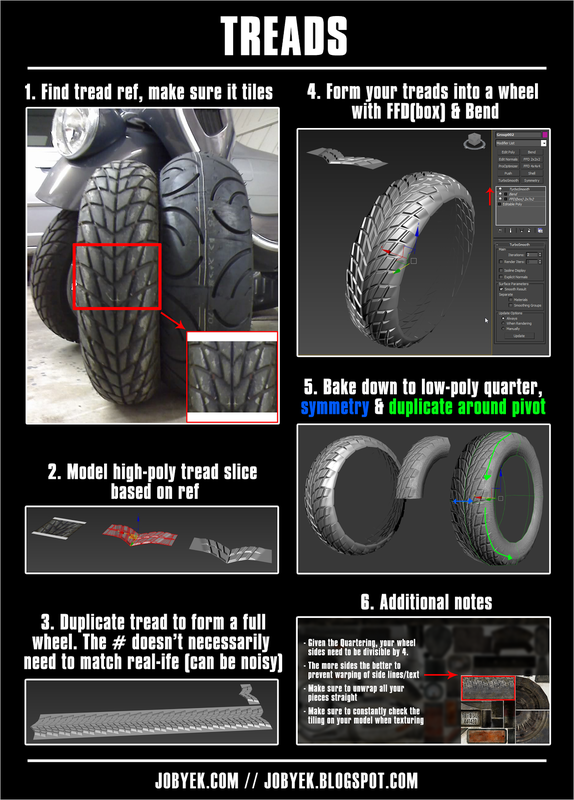 By not fully uniquely unwrapping your wheel tread and sides and only being able to focus on a quarter of your wheel, you can maximize its resolution (by maximizing the quarter shell size to what you would use for a unique unwrap all while leaving room for other elements) and make it match if not exceed the resolution of the vehicle body as well as speed up texturing time (although it comes with its own challenges to make sure details don't tile badly). 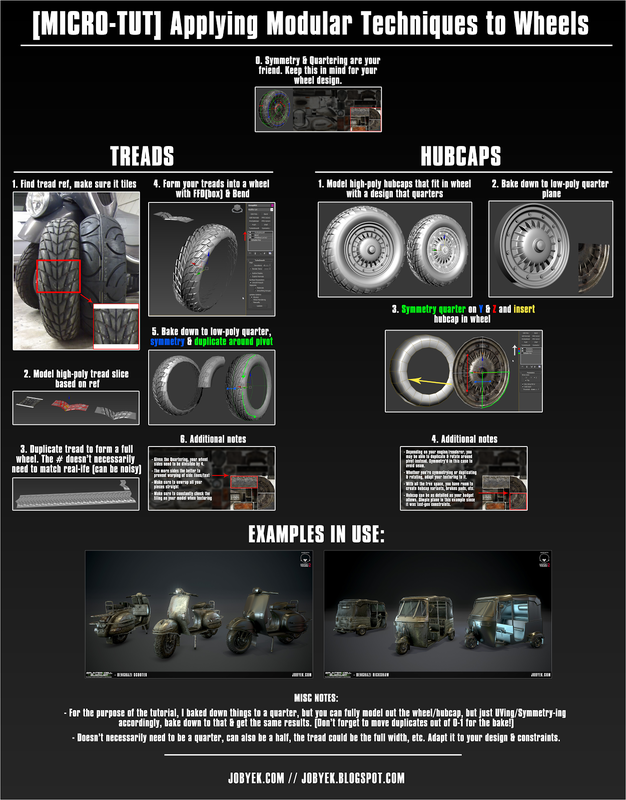 Knowing this, you need to fully keep this in mind as you flesh out the design for your wheel/treads/rims/etc. And there it is. Doing this technique is definitely a bit more involved and takes some light planning. However, for the gains in quality and resolution you get for the vehicle as whole through the wheel, I think it's worth doing. Symmetry and quartering shouldn't just be used for this, it can also obviously be used for any type of repeating parts of a model (e.g. either side of a vehicle, concrete dividers, tank treads, etc.) 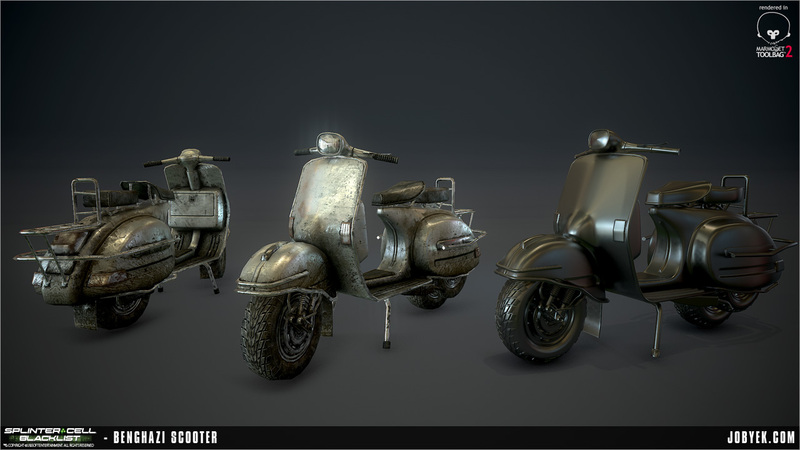 which you don't want to double up work on and save precious UV space, so long as you break it up cleverly in the texture or with other unique middle pieces in the model. As always, I'm always open to critique & feedback to the blog post. All I've said can most definitely be updated if anyone brings up any issues or things worth clarifying. Just give me a shout on Twitter @jobyek or in the comments!